Specifications: 10 meter operational range; Pairing with up to 8 devices, 2 simultaneously; 2 hours talk time, 8 with charger; headset weighs 7 grams, charger weighs 26 grams; Charges through MicroUSB. Price is on the high side. Summary: I've been a Jabra user for many years, and with my older headset beginning to show its age, I wondered if the small STONE could suffice for this large man. What I found was much more than I was expecting, with only a few "gotchas". Read on to hear more! 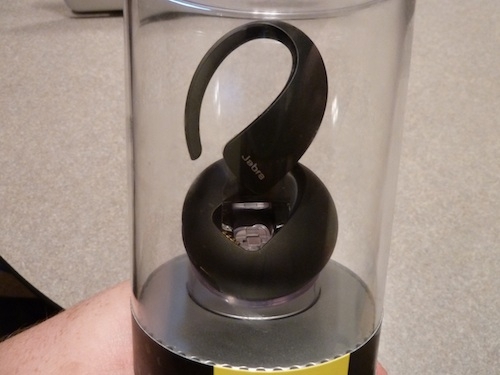 So, previously all of the Jabra products I've used have shipped in very nondescript packaging that was ripped open, discarded, and never thought of again. The STONE, however, was a clear exception. The following pictures speak to the unboxing experience, and as a picture is worth 1000 words, I'll give you the equivalent of 7000 words on this page! 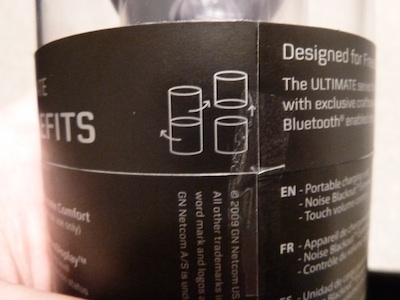 Figure 1: The Jabra STONE arrives in a hard plastic cylinder, prominently displayed. Figure 2: The top of the cylinder, headset and STONE charger. Figure 3: Helpful opening instructions which really did work without any force, the paper is designed to rip and open into two halves easily. All of the plastic snaps together and can be disassembled with only a bit of effort (once one sees where to twist). The packaging is nice enough that once the Jabra is done with its "primary" life, it'll look very nice on the shelf as the "spare" headset. Figure 4: The headset. The hook fits nicely around the back of the ear, and the ear piece fits within the ear, creating a very small profile when worn. Figure 5: The back of the headset, and speaker grille. 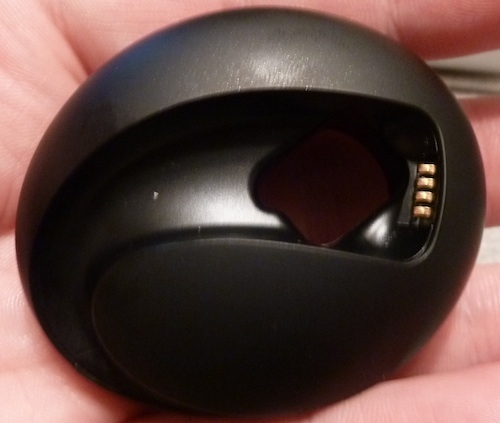 Figure 6: The STONE charger that the headset charges in while both connected to MicroUSB and while standing alone in a pocket or bag. MicroUSB! No proprietary charging cable needed!!! Once I freed the headset from its plastic prison, and took a few shots of it above, I compared it to the Jabra BT8010, my previous headset for the past 3 years. As you can see, the STONE is quite a bit smaller than the BT8010. 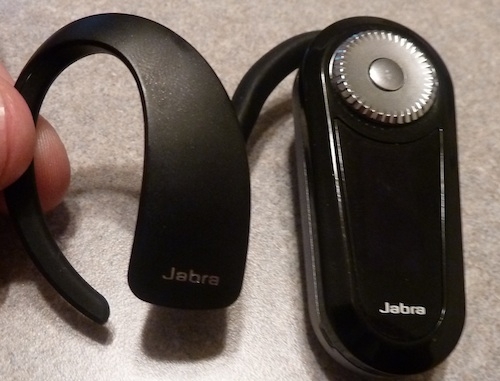 Figure 7: The Jabra STONE on the left, the Jabra BT8010 on the right. So it's no surprise to say that it looks nice and small, and even in its STONE charger is not even remotely bulky to carry. But how does it work? "Talk time up to 8 hours (2 hours in headset and 6 additional hours in the portable charging unit)" Been using it all week and haven't had to charge it again. The portable charging unit really shines as a great example of innovation. It could eliminate the need to take a charger on short trips entirely. However, since Jabra has finally gone with a standard charger (MicroUSB) rather than proprietary, that's a moot point too! "Dual Microphone solution for Noise BlackoutTM Extreme" I've used phones with dual microphones to blackout background noise before and had good results. However, in my tests the people at the other end of my calls didn't seem to notice any difference between this headset and others I've used. Granted, I suppose I might not have found the noisiest background for testing. "Noise dependent volume control* (Volume is adjusted automatically when you enter a noisy environment)" and "Automatic volume adjustment on received audio (Volume is adjusted automatically if incoming voice is too low)" I had no problem hearing others, only having to adjust the volume manually a few times (and then mostly when switching from audio to phone). The volume slider, by the way, is a nice feature - simply slide your finger up and down the body to raise or lower the volume. "Audio shock protection" I literally have no idea what this means. 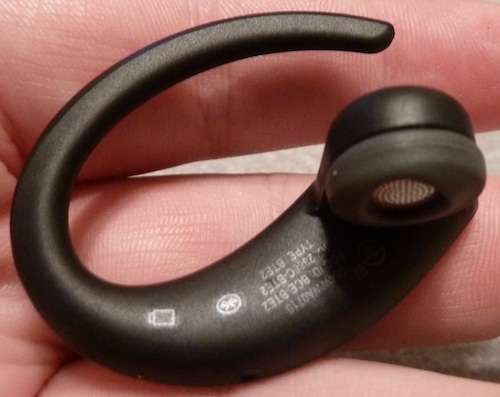 The STONE does away with some of the more familiar aspects of Bluetooth headsets (such as visible buttons and the need to turn it on or off), however it performs about the same as any other Bluetooth headset I've used. The sound quality in a phone call, both on my end and on theirs, was adequate, however despite its advertised superior sound quality, I've yet to be in an environment that it really comes through in. I don't doubt it's functional, I just rarely find myself using the phone in an extremely noisy environment where the filtering would be essential. The best improvement over my old Jabra was simply the size - the STONE fits nicely and fairly discretely in the ear and can easily be stowed without fear of the hook falling off (a frequent problem with the BT8010s). The STONE charger includes a clip that can easily and securely clip it onto a bag strap or belt, allowing you to take it off your ear and place it in the charger in one motion, from ear to waist. The portability of the STONE charger, and its ability to keep the headset in a "deep sleep" mode such that the headset is charging yet ready for the next phone call, is definitely the headset's most enduring and innovative feature. The clip on the back, which you can remove if you like, is also deep enough that it felt secure on a bag strap (I normally wear my gear bag slung across my chest). As I moved throughout NYC I didn't feel as though I was one step away from it falling off! Oh, and remember how I said you don't have to worry about the hook falling off like it did on earlier Jabras? Well that's because this headset is Right Ear Only. If you're missing a right ear, or simply one of the 15% of the population that is left handed, you may want to consider that before purchasing. I applaud Jabra for realizing that ambi-ear designs can be prone to challenges (hooks falling off, ear pieces that need readjustment) and choosing to create a sleek unibody style that favors the right ear - however others may not agree or feel comfortable with it. My previous headset, the BT8010, was rather innovative in that it supported A2DP and had 2 earpieces, the headset that was powered and used whenever taking a phone call, and an optional second speaker that attached via a wire that ran around the back of the neck. This allowed stereo sound through two powered speakers, which provided a truly great audio experience. On the STONE, the experience is less than stellar. The STONE does support A2DP, so you can stream audio to it (an experience that was very easy to set up on my Nexus One). However, the speaker's positioning and smaller size really make the music experience sub-par. If you're going to be using the headset 90% of the time for phone calls, 10% or less for music, then you won't mind it. However if you're on the flip side of that (which I am on certain days), it can be irritating. 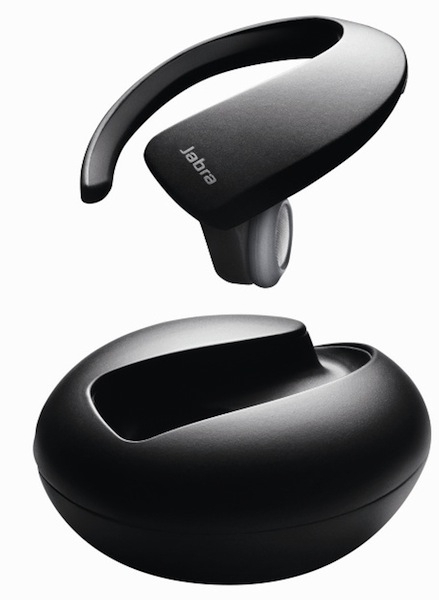 The Jabra STONE is a well designed and innovative headset from a maker with a long history of design excellence. However like its older siblings there are a few "gotchas" to be had. The A2DP support provides a lackluster experience, and some may not like its design which places the speaker nearly in the ear and not over it. Its small size, portable charger, and MicroUSB support distinguish it from others in its pack. For someone who uses it exclusively for phone calls in noisy environments, and is somewhat style conscious, it is a must have! Jon Westfall is the News Editor of Windows Phone Thoughts, a member of the Thoughts Media network. He works in New York City as the Associate Director for Research & Technology at the Center for Decision Sciences, a part of Columbia Business School. He has been recognized as a Microsoft Most Valuable Professional (MVP) Since 2008. I have a Jabra Stone which replaced a Jabra 5020 that got dropped one too many times, and is sadly no longer being made. Unfortunately, for me, the Stone is too big for my ear -- it pushes against the lower part of my ear making it very sore. The 5020 was slightly larger but of a similar design except that the part that fits into the ear pivots so it can be used in either ear. More importantly, it is adjustable vertically as well so it can be adjusted not to press against the lower area. I prefer the type that sets in the ear (as both of these do) because I can answer a regular phone without having to remove the Jabra. Thanks for your review Jon. I'd been curious about this set myself. I like the design and size of the headset. I just wish the belt clip was a little sturdier since it broke after about a week of use. Great review Jon! This will be my next headset replacing my Jawbone II soon. Love the fact that it's micro-usb instead of the proprietary crap their previous headsets used. The sturdy form factor is also a big plus for me, as I can now safely put the headset in my pocket without worrying about breaking the fragile loop. The Jawbone ear loop constantly broke when I put the headset in my pocket, or I'd forget and leave the headset on a table somewhere after taking it off. And they're not cheap. So I started leaving the headset in my ear a lot of times--but then I'd always look like a douche to people At least with this I can store in comfortably in pocket or on belt clip. Last edited by Eriq Cook; 08-15-2010 at 09:40 PM.. I ordered one of these after reading the review. Got a white box unit out of Hong Kong for <$50. Works as Jon says. Packaging wasn't as slick, but that was going into the trash anyway. Very comfortable in my view as it doesn't have to cram into your ear to stay put. The charging 'stone' is very convenient. I paired it with my iPhone and like the way it works. Every sound is forwarded to the headset once it is out of the stone. Voice Control works reasonable well too. A couple of minor points that I really like is that the included USB to mini charge cable is only about 8" long, and the cord on the wall charger is only about 8" as well. I appreciate that actually. I have two many little devices whose chargers take up twice as much room as the device when travelling because they think I need a 6 foot cord on the thing. Thanks for writing this up Jon. I LOVE it. I leave it in all the time and it's the best headset I've ever used. Battery life isn't as good as the Panasonic 855, but the other features are fabulous and I talk more than the specs on the box. :-) Plus with the pebble thing it works great. Most recently the Panasonic 855, but I only used one side, not in stereo, just wanted the A2DP. When I started calling Jabra, Blue Ant, etc. they thought I was nuts asking for it in single ear headsets. Now they make them though, so I'm really happy! I'd always used Jabra before and that was my first Panasonic. I really liked it though. 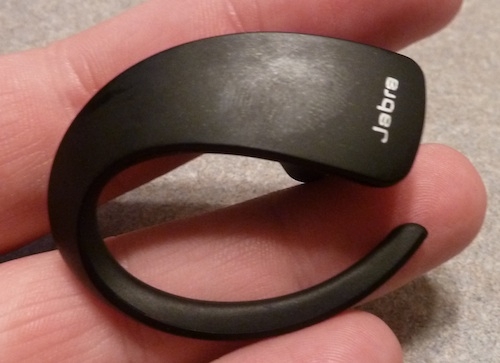 This Jabra is seems to be better outside in the wind and less obvious in my ear. I almost missed the extra ear band in the package. That really helped keep it in my ear. It was in the AT&T package I returned, but not in the cheaper one I got from the cellphoneshop.com. I ordered extras directly from Jabra and they should be here any day, not expensive either.